Earlier this week, wheezing reddened pile of bagpipes Rush Limbaugh objected to the news that there’s liquid water on Mars—it’s more like a “sneaky leftist agenda” on Mars to get people to care about climate change, he argued, for some reason. On Tuesday, he went ahead and brought Muslims into it, too. Why not. 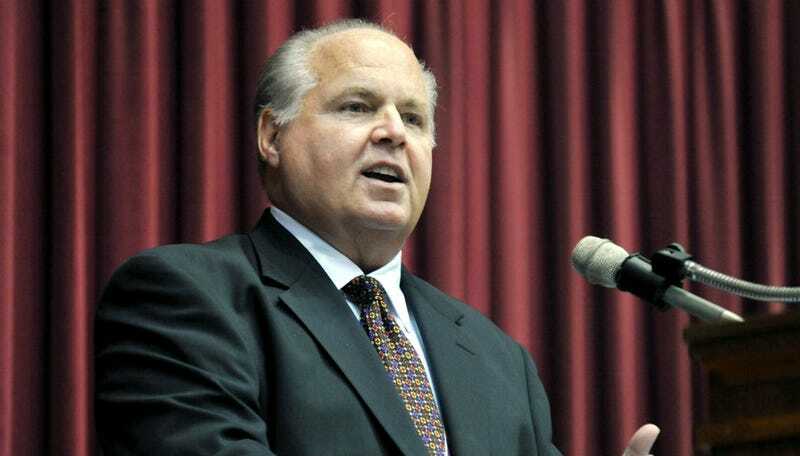 Essentially, Limbaugh’s suspicions stem from the fact that NASA says Mars was a pretty wet planet roughly four billion years ago, until something made it mostly dry up and freeze over. Maybe it was one “catastrophic event,” they speculate, or a gradual loss of carbon dioxide. In any case, Mars’ climate definitely changed, and when you put the words “climate” and “change” together, Rush hikes himself off the toilet where he’s been sulkily reading yellowed John Birch Society pamphlets for sixteen hours straight and comes running. After registering his objections to...Mars, Limbaugh further entangled his planetary theories with a conspiracy theory about Muslims. Media Matters has a transcript of what he was getting at, which is, briefly: that NASA is now devoted to “Muslim outreach” and also doing PR for Matt Damon’s new space movie. Let’s look at this Mars business. Yesterday we had the most incredible announcement from NASA that — and this is what is not reported in the Politico, I don’t know if these local TV info people in Dallas even know what I said. I doubt that anybody reporting on what I said actually knows what I said. I doubt that any of them actually went to my website to read the transcript of what I said and then report on it. Even after reading what Media Matters took out of context and reported, their curiosity was not even such that they would go to my website to see if what they were being told was accurate or true. So yesterday, we have this big announcement that they found flowing water on Mars and that two-thirds of the planet used to be an ocean, two-thirds of the Northern Hemisphere used to be an ocean — it was a mile deep. I raised the question, how do we know this? Have we probed a mile deep? We know that there’s always been water on Mars because they have ice caps on the poles. So it’s not news that there’s water. That’s why they said free-flowing water. But that wasn’t the big deal. The big deal was that some scientist — and it was important to call the guy a scientist — some scientist said that a catastrophic event probably related to climate change on Mars resulted in this. I’m sorry folks, but that’s not science and that’s not even a good wild guess. How can there be a catastrophic event on Mars when there is nobody there to experience the catastrophe? How can there be a catastrophe on Mars when we can’t even prove it? All we can do is wild guess it? And the very fact that my objection to this is being noted is proof positive that there is an agenda attached to this. Otherwise they would leave my comments alone. There is an agenda attached to it and they’ve got to try and discredit anyone, in this case me, who is attempting to attach whatever they’re doing with Mars and the news they’re reporting to the Democrat leftist agenda, which, of course, is climate change. And I predicted yesterday that it would not be very long before we would see evidence that my reaction and take on all this is accurate. And lo and behold, right here, in my formerly-nicotine stained fingers, from Yahoo! News, did NASA time its Mars announcement to coincide with The Martian, a movie starring Matt Damon? NASA wants to go to Mars. And Obama has turned NASA over to Muslim outreach, in case you’ve forgotten. NASA wants the money to go to Mars. It makes total sense in the world that they would time, NASA, the release of, “Look what we found! We found flowing water on Mars! On my god. there could be life! On my god, we gotta go we gotta go!” And here comes the movie. They throw in climate change relationships just for a little dot the I, cross the T, and magic happens. Or possibly someone needs to crank fresh oxygen into Rush’s booth.